Bake biscuits as directed on can. Cool. With sharp knife, cut each biscuit into 3 layers. In small bowl, stir together mayonnaise, chopped basil and lemon juice. Add pepper to taste. To make each biscuit stacker, spread mayonnaise mixture on bottom layer of biscuit. Top with 1 slice of cheese and 2 tomato slices. Add center layer of biscuit; spread with mayonnaise mixture. Top with 2 tomato slices, basil leaves and top layer of biscuit. Place biscuit stackers on platter. 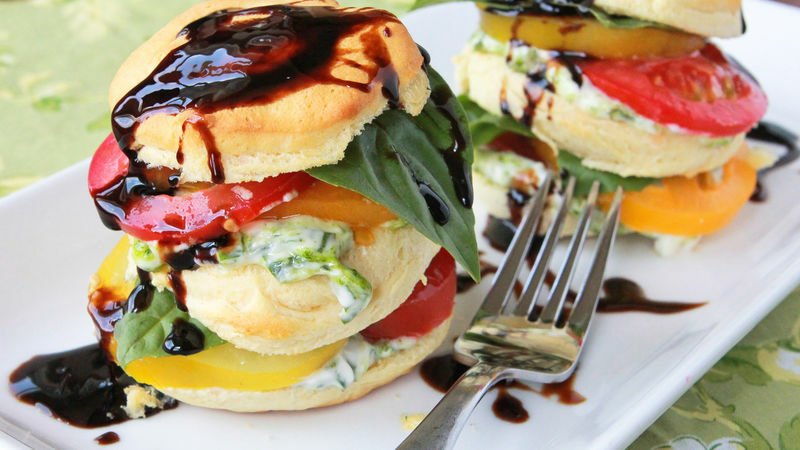 Drizzle stackers with balsamic reduction sauce. Serve immediately. For extra flavor and beautiful color, use heirloom tomatoes instead of traditionally grown tomatoes in this recipe. Balsamic reduction sauce (also called “drizzle” or “glaze”) can be found in the Italian foods section of most grocery stores.